Slingsby was a great one for theories. Over a pint and a roll-up or two he could always be relied upon to keep his companions amused with whacky stories. Many of his observations made it to be the titles of his tunes: The Revenge of the Kerbstones was one such theory-turned-tune-title. Xero reasoned - although maybe 'reasoned' is not quite the right word for whatever it was that went on in his head - that these seemingly inoffensive bits of stonemasonry become extremely pissed off at being trampled on all day long. So much so that at 3AM they lie in wait for the poor unsuspecting drunk who has missed the last bus, hasn't got enough money for a taxi and is trying valiantly to stumble home. 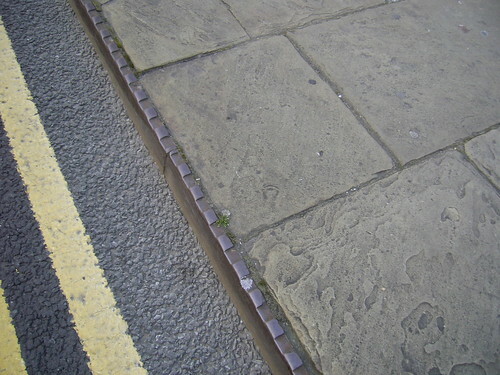 It is then that the Pavement leaps up with all its might into its victim's face. There were a great many nights during Slingsby's mis-spent youth which might have provided the inspiration for this ontological profundity.